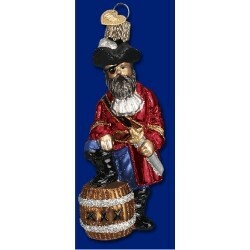 Arrrgh, Matey, don't you just love the rough and tumble look of the Captain Bill the pirate glass Christmas ornament. With a powder keg and sword ready for battle, this ornament shows great detail in its blown glass body and terrific paint job. It's one of our popular Christmas ornaments for boys personalized with their name, but any fan of the history, lore or movies about pirates will love this one. The Captain Bill, the pirate blown glass personalized Christmas ornament ships your way in our black drawstring pouch, a Russell Rhodes exclusive.